CORD leader Raila Odinga has sent a message of goodwill to the newly elected President of Tanzania John Magufuli. 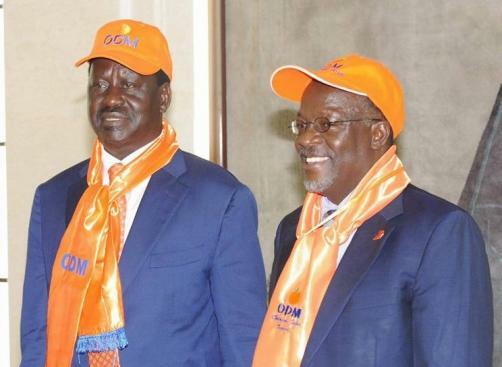 "Please accept my warmest congratulations personally and on behalf of the Orange Democratic Movement, the Coalition for Reforms and Democracy and Kenyan people," Raila said in a message to Magufuli. Raila called on Kenyan leaders to borrow a leaf from Tanzania on how to conduct peaceful campaigns and elections. “The brilliance and tone of your campaign demonstrated the maturity and vitality of democracy in Tanzania and we hope that these timeless values will see relations between our two nations get stronger under your leadership,” Raila said. Raila called on Magufuli to prioritise unity and stability in Tanzania and push for regional integration and democracy in Africa. Magufuli the ruling party CCM candidate was declared the winner on Thursday after the national electoral body dismissed opposition complaints about the process and a demand for a recount. He garnered 8,882,935 votes against Lowassa's 6,072,848.